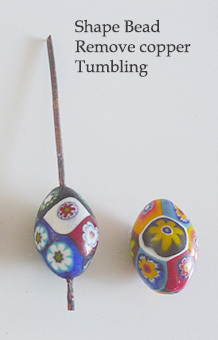 What goes into making a millefiori bead? What are they always different? What makes them smooth? and other questions you’ve always wanted to know about millefiori! First the canes must be made. 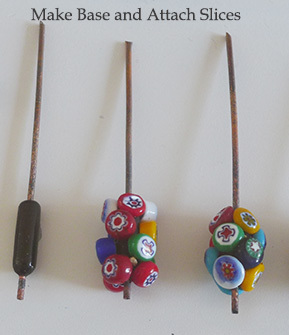 And since there are many different opaque millefiori slices of canes used in this particular millefiori bead, well there are about 120 opaque canes that must be made by Effetre (and known as Moretti Canes) in Murano. In the picture below, friends at another furnace are making cane glass for us. 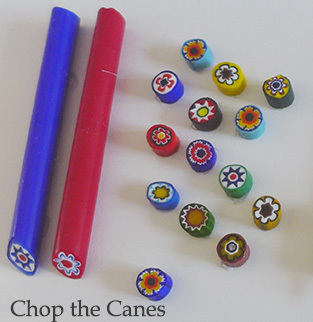 The slices of canes must be warmed or the bead will crack. This is done by laying them on a small tray beside the torch as the bead maker deftly wraps the melting cane which creates the base of the bead. 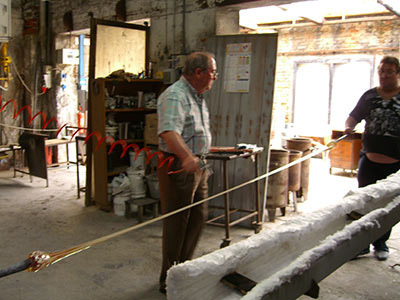 Then carefully, using tweezers, they place the canes one by one onto the base of molten glass. In the picture you see first the base and next to it, the base with slices applied, and already you can tell they have put it back into the flame, as the straight sides of the canes have begun to become slightly round. In the third, you see that by holding the bead in the fire, the canes begin to meld together. There is surely a technical term, but you just need to know that the glass flows toward the heat. At this point, there will still be slight bumps or separations and the bead is not smooth. Here’s where the last secret come in. The Moretti brothers are credited with inventing a technique of “burattatura” a name that came from the use of a wooden barren (buratto) which they turned to smooth and polish the beads – a departure from the time consuming task of polishing with a cork wheel and water which was also expensive and impossible for small beads. They put the beads in the barrel along with sand and water. The sand becomes more sottile (fine) in the process which takes about 7 days and with the final time devoted to the polishing, part of the secret! Even today no one outside the Moretti company knows the exact process they use. Thanks to our good friend Gianni Moretti for his research and writings as well as his exhibits at the Museo del Vetro in Murano. 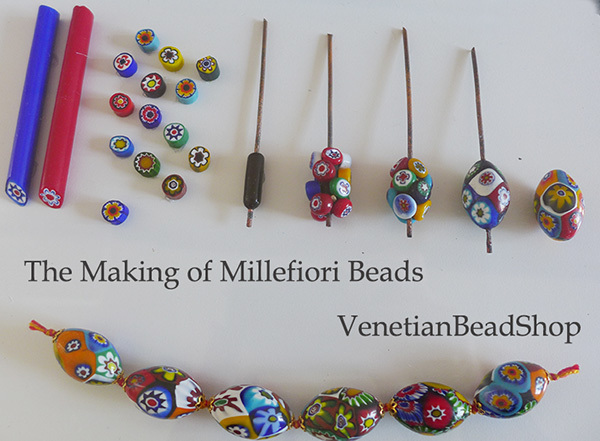 Shop our great selection of Millefiori Beads. I tried to make this bead but the white in the chips turns a sort of grey and rough on the edge. What do I do wrong? Hi Maureen, You can ask someone as ISGB.org the International Society of Glass Bead Makers. They have members (including us) around the world and surely someone near you where you could take a class or they could answer your question.